How can I cancel my subscription? How can I close my account? What is the difference? This would stop the invoicing process, but not instantly delete your account, so you could still access it at a later time and/or reactivate the subscription, if needed. The cancellation can be done from Settings >> Subscription details, then click on Change payment details and in the new tab (hosted with our payment processor - Chargebee), scroll all the way to the bottom and click on Cancel this subscription. This can be done from Settings >> Account settings and then all the way at the bottom, click on Close account. 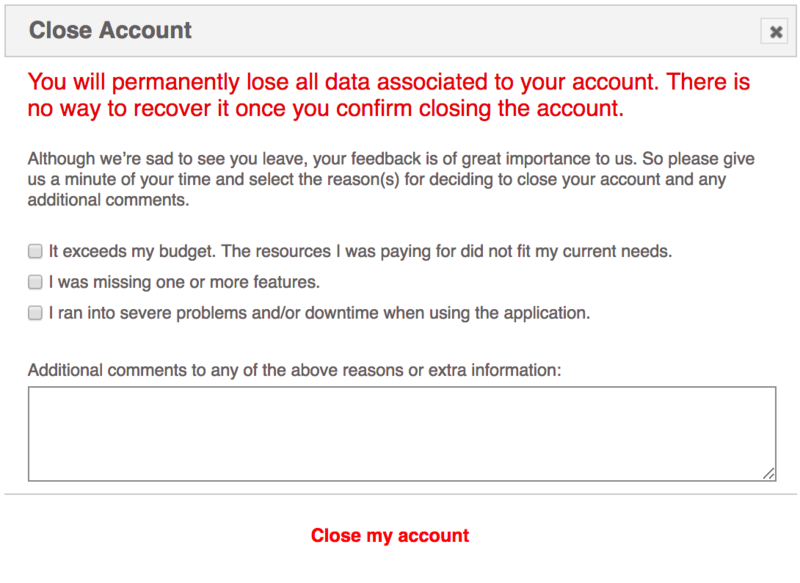 It prompts you for a reason for closing the account and the warning that this action is permanent, as it cancels the subscription AND deletes your account and data. You would be unable to access it at a later time, nor reactivate it. As always, our Customer Success team is here to help with any questions that might come up. Just give us a buzz through the in-app chat or via email.